CIA Officials Defy Obama Directive on FOIA which states that "the Government should not keep information confidential merely because public officials might be embarrassed by disclosure, because errors and failures might be revealed, or because of speculative or abstract fears." 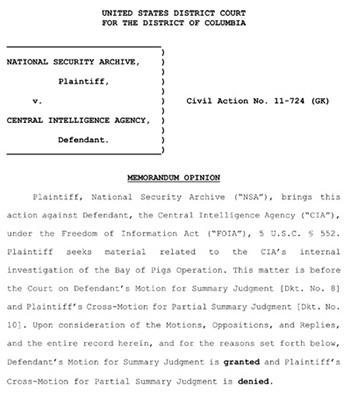 Washington, DC, May 10, 2012 – More than year after the National Security Archive sued the CIA to declassify the full "Official History of the Bay of Pigs Operation," a U.S. District Court judge today sided with the Agency's efforts to keep the last volume of the report secret in perpetuity. In her ruling, Judge Gladys Kessler accepted the CIA's legal arguments that, because Volume V was a "draft" and never officially approved for inclusion in the Agency's official history, it was exempt from declassification under the "deliberative process privilege" despite having been written over 30 years ago. The National Security Archive called the decision "a regrettable blow to the right-to-know" and vowed to press the Obama administration to force the CIA to adhere to the President's Executive Order 13526 that "no information shall remain classified indefinitely." 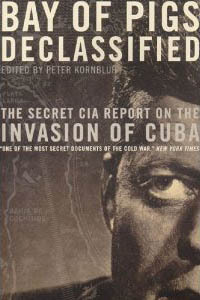 The volume, titled "CIA's Internal Investigations of the Bay of Pigs Operations," was written by CIA historian Jack Pfeiffer in 1981. It forcefully critiqued the scathing investigative report written in the immediate aftermath of the paramilitary attack – by the CIA's own Inspector General, Lyman Kirkpatrick – which held CIA planners fully responsible for the worst debacle in the Agency's covert history. In court papers, CIA officials described Pfeiffer's critique as "a polemic of recriminations against CIA officers who later criticized the operation." "When it comes to protecting its own, the CIA appears to have a double-standard on history," said Peter Kornbluh who directs the National Security Archive's Cuba Documentation Project which brought the FOIA lawsuit. Kornbluh noted that the CIA had no problem declassifying Volume IV of the official history–also a draft– in which Pfeiffer attacked both President Kennedy for his role in setting restrictions on the overt elements of what was supposed to be a covert, and "plausibly deniable," operation, as well as Attorney General Robert Kennedy for his role in the Presidential commission, led by Gen. Maxwell Taylor, that investigated the failed invasion. "Apparently, the CIA sees no problem in the American public reading a 'polemic of recriminations' against the White House," according to Kornbluh. "But the CIA claims 'historical accuracy' as a reason to withhold documents critical of its own officials." In her ruling, Judge Kessler stated that "disclosure of a draft history would risk public release of inaccurate historical information." She also cited the arguments of CIA Chief Historian David Robarge that "disclosure of Volume V would have a chilling effect on CIA's current historians who would henceforth be inhibited from trying out innovative, unorthodox or unpopular interpretations in a draft manuscript." But the Archive characterized the CIA's effort to cast itself as guardian of accurate and honest history as an exercise in cynicism. "The idea that the CIA can advance the cause of accurate historical analysis by hiding history from the peer review of the public is preposterous," Kornbluh stated. He noted that it was the Agency's selective declassification of the Pfeiffer volumes that fostered inaccurate historical information. "The real chilling effect of the CIA's selective cover up is on the public's ability to access and analyze the complete historical record on the Bay of Pigs." The Archive's lawsuit did yield the release of Volumes I, II, and IV. Volume III was previously released under the Kennedy Assassination Records Act in 1998. Those four volumes can be read here.